Unless you’ve been living under a rock (or maybe in your parent’s basement), you can’t help but notice the incredible boom within the North American craft brewing industry. I was curious so I performed a simple search using www.brewerymap.com, and found that there are 249 breweries within 100 miles of our SOLIDWORKS headquarters in Waltham, Massachusetts. That’s amazing! To put it slightly more into perspective, there are so many breweries opening up in the United States, that there is actually a shortage of hops, but we’ll save that topic for another time. So for a beer geek like myself who enjoys these flavorful and pungent beverages, my fridge is usually stocked with a wide variety of choices – from a chocolate-flavored stout, or a hopped-up IPA, or even a lip-puckering sour gose. The easiest way for me to get my hands on these brews is to simply peruse my local package store (aka beverage barn or liquor store for those not from New England) that offers a great selection of craft beers. But sometimes, shopping at my local package store just isn’t enough, because some of the most sought-after beers can’t be found on any of the local distribution lists. So there’s only one solution to this problem – and that equals, a road trip. In my role as a technical manager, I get to travel quite a bit, and I’ve been lucky enough to have visited quite a few breweries all across the United States, and lucky for me, many of the best (in my opinion) are right here in New England. When visiting these craft brew houses, you typically have to wait in line with giddy anticipation like a child waiting for Christmas morning. I definitely get excited about wrapping my fingers around a frosty can of some new concoction they’ve conjured up. But as an engineer, what I truly love checking out is the actual brewing process – even if it’s just a small glimpse into the heart and soul of these little shops. Now granted, it’s not always possible due to the large volume of people who share this affinity for craft beer, but I try to stick around the shop and observe the brewers as they are hard at work creating a masterpiece we can all enjoy. Watching them dump huge bags of grain into a mash tun, or pour buckets of citra hops into a massive kettle, or even witnessing the automated seamless motion of the canning process. It all brings a twinkle to my eye. Sometimes, when I get the chance to see a brewery in action, I give myself a sly smirk, pointing to things around the room with a slight nod of my head, and think, “look at all this awesome equipment,” and “that thing was designed in SOLIDWORKS, and that was designed in SOLIDWORKS, and that, and also that.” This tasty beer I’m holding in my hand wouldn’t be here if it weren’t for SOLIDWORKS. So I came up with an idea. What’s the one thing all of these breweries have in common? It’s that they all started in someone’s kitchen, basement, or garage – just like I do when I break out my own home brew kit. 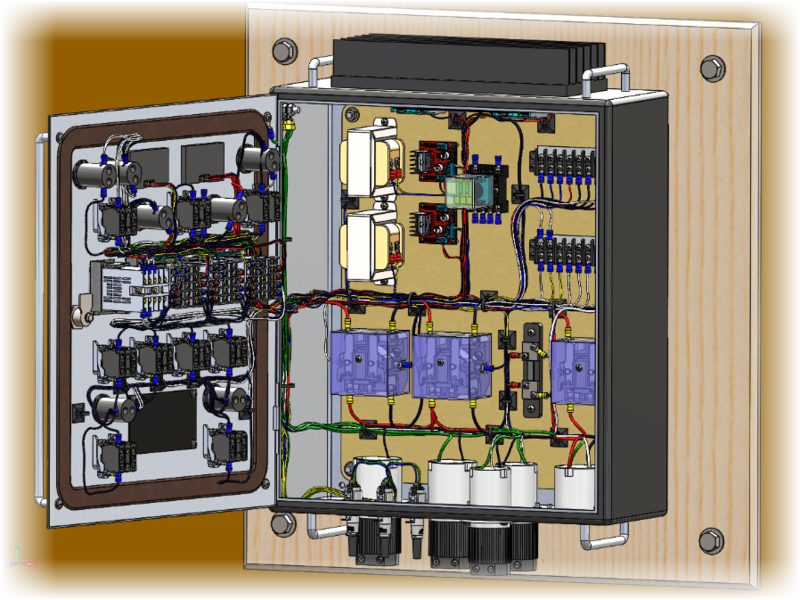 So I decided to take my love for SOLIDWORKS and my interest in craft brewing and combine them to create a SOLIDWORKS Electrical project, as well as an entirely new SOLIDWORKS assembly. I call it – The SOLIDWORKS Brewery. It’s a digital brewery that we can use to mock up new layouts for the home brewing floorplan. We use SOLIDWORKS Electrical to route the wires, cables, and hoses for the control cabinet and pumps, or render our assembly in SOLIDWORKS Visualize to create an extremely realistic view. And down the road, I plan to use SOLIDWORKS Simulation to run scenarios on the kettles and heating elements, use SOLIDWORKS PCB to create a new circuit board for more intelligent automation, even use Weldments on our brewery tables, Sheet Metal on our exhaust duct, plus several other features as well. Sounds cool right? I also conducted a 22-Minute Webinar talking about this home brewing system and how you can take advantage of the features built into SOLIDWORKS Electrical and apply them to your own projects. Click here and register to watch the recorded webinar! Still looking for more? Here’s the best part. In a few weeks’ time, my SOLIDWORKS teammates and I will be brewing an actual beer using the same electric brewing system you see here in our digital brewery. We will be producing a video mini-series that walks us through the various stages of the brewing process while we also cover several features, tips, and tricks related to SOLIDWORKS Electrical. Read this blog post to get an introduction to the Brewing with Electricity project. I am extremely excited about this interactive project we’re creating and we hope you will be too. So keep an eye out and your taste buds ready for more information about this awesome brewing adventure with The SOLIDWORKS Brewery. If you’re a fan of Twitter, you can follow me @SWECAD. 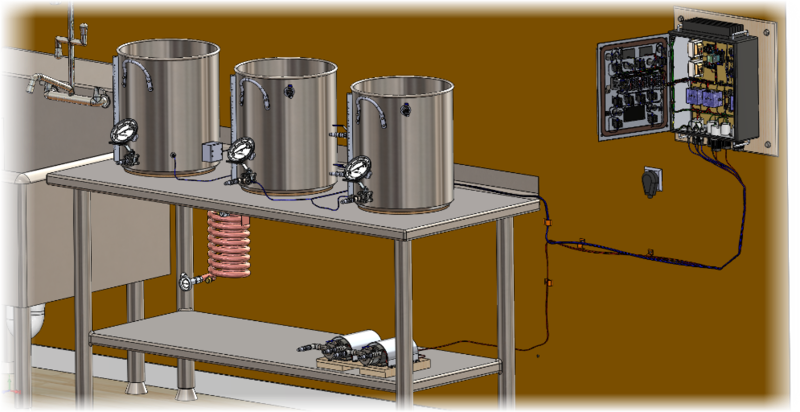 Watch the homebrewing with SOLIDWORKS webinar today. Click here and register to watch the recorded webinar!